The American Lung Association (ALA) has launched a TV and digital ad campaign touting EPA’s Clean Power Plan, also called the carbon “pollution” rule for existing power plants. Power plant pollution is a serious threat to our health, especially to kids. Check out our new television commercial to see what we’re doing to standup for little lungs vs. big polluters. The commercial, titled “Mother’s Instinct,” features a baby boy in a crib with a monitor that lets Mom (and us) hear him breathing. The Clean Air Act stops polluters from poisoning his [the baby’s] air with arsenic, lead, and mercury. Now the loophole that let’s them pump unlimited carbon pollution into his air is closing too . . . if polluters and their friends in Washington don’t interfere. Don’t let polluters weaken our clean air protection. As the narrator says the words “if polluters,” the baby disappears from the screen and instead we see what looks like smoke billowing out of the stack of a coal power plant. Fact check time. First, mercury emissions from power plants do not poison anyone’s air. When mercury emissions deposit in soils and water bodies, bacteria can transform inorganic mercury (Hg) into methylmercury (CH3Hg), an organic compound that can bioaccumlate in aquatic food webs. In theory, American women who consume hundreds of pounds of self-caught (non-commercial) fish from the most contaminated water bodies can damage the cognitive and neurological development of their unborn children. However, in the 24 years since Congress tasked EPA to study the health risks of mercury, the agency has not identified a single child whose learning or other disabilities can be traced to prenatal mercury exposure due to maternal fish consumption. But even if mercury in fish were a significant health hazard, it would still be false to claim that power-plant mercury emissions poison the air kids breathe. The case is somewhat similar for arsenic. Inhalation is a “route of exposure” but mainly as an occupational hazard at certain types of industrial facilities that emit arsine gas. For the general population, which includes children, the main route of exposure is ingestion of contaminated food or water. More importantly, carbon dioxide (CO2), the substance targeted by EPA’s Clean Power Plan, is non-toxic to humans and animals at multiple times today’s atmospheric concentration (~400 parts per million) or any level reasonably anticipated for centuries to come. What’s more, CO2 is a basic building block of the planetary food chain, and rising concentrations boost plant productivity, water-use efficiency, and resistence to environmental stresses, conferring multi-trillion dollar benefits on global agriculture. At most, the Clean Power Plan would reduce atmospheric CO2 concentrations by a few parts per million by century’s end. What biological difference could that make to babies, when their exhaled breath contains about 40,000 parts CO2 per million? A final point, the “smoke” coming out of the stack at the close of the ALA video is most likely harmless steam. Yet the ad insinuates the gaseous emission is “carbon pollution” — impossible since CO2 is as clear as oxygen! Carbon dioxide is a natural constituent of clean air. Instead of trying to manipulate maternal instinct for political ends with false fears of carbon “pollution” invading “little lungs,” why doesn’t ALA argue for EPA’s Clean Power Plan as climate policy on the merits? ALA doesn’t because no one can. EPA claims the Plan will deliver $31 billion in climate benefits in 2030. The agency’s estimate is flimflam, as explained in a previous post. To recap, the Plan would avert only a hypothetical and undetectable 0.018°C of global warming by 2100 (assuming EPA climate sensitivity estimates). That is too little to have any practical benefit for farmers, coastal communities, or polar bears. The benefits would be even more miniscule in 2030. Yet the Plan would impose roughly $8 billion in annual incremental compliance costs in 2030, according to EPA’s own estimate. As with other carbon reduction mandates, the benefit-cost ratio is abysmal. This partnership is based on more than a coincidence of interests. As of December 2012, ALA had received more than $24 million in EPA grants. 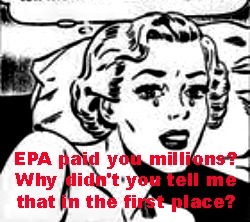 EPA is a major funder of ALA. Should anyone be surprised ALA is among the fiercest defenders of EPA’s power and budget?